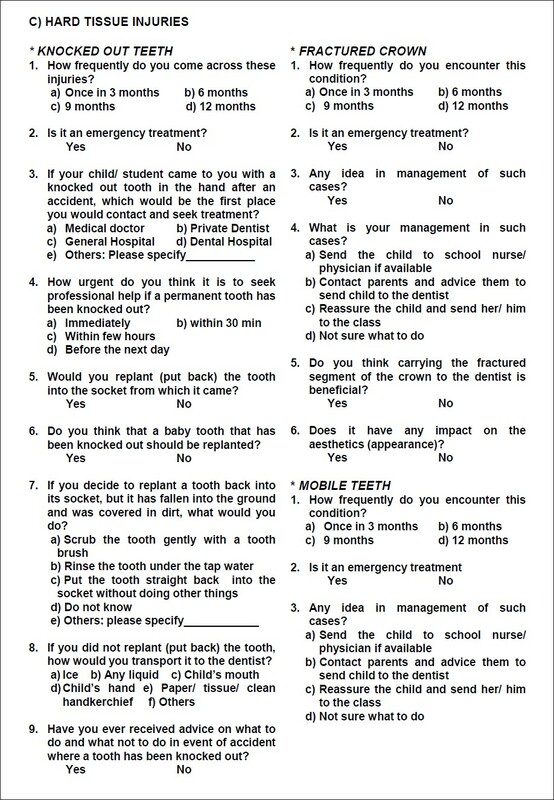 Aim: To assess awareness of school teachers concerning the emergency management of traumatized teeth. Materials and Methods: This is a prospective intervention study conducted with 1000 teachers (500 urban, 500 rural) randomly selected from the entire government and private, primary (elementary) as well as secondary (high) schools of Nellore district of Andhra Pradesh, India. Study was carried out in three phases; the first phase being an initial survey conducted to assess the existing knowledge of teachers on management of traumatic injuries by using self-administered questionnaire. This was followed by a comprehensive informative promotion regarding the initial management of the traumatic dental injuries for the teachers. A post-promotion follow-up review was conducted 3 months later to evaluate the effect of the informative promotion, using the same set of questionnaires. Study was completed over a period of 9 months. Statistical Methods: Data analysis was done using SPSS software version 14.0, and Chi-square test was used to compare the knowledge of teachers prior to and after the informative promotion. The level of significance was set at P ≤ 0.05. Results: The teachers' overall knowledge with respect to the emergency management of the traumatic injuries was deficient and significant differences were found in the knowledge of teachers before and after the informative promotion. Conclusion: Informative promotion programs to improve the knowledge and awareness of this group of community, who are generally the first line of assistance in case of dental trauma in schools, are mandatory. As noted above several studies conducted all over the world reveal scarce knowledge regarding emergency measures for traumatized teeth. Hence, a forward step is needed to be taken by the dental professionals in this particular area. The prime objective of this study was to assess the knowledge and attitudes of school teachers (primary and secondary school teachers) on the management of TDI and to update their information with informative promotion on initial management of TDI wherever necessary. The initial survey was followed by a comprehensive informative promotion regarding the initial management of the TDI in schools, which included an informative 30-min lecture on the management of TDI, and general oral hygiene practice methods was conducted in the schools using MS Power Point presentation (Microsoft Corporation, Redmond, Washington, USA) or with the help of a self-prepared manual (flipchart) containing pictures, in places without projector facility as used by Al-Asfour et al. The lecture was delivered using simple language with emphasis on important information like; short introduction to dental tissues, different types of TDI, emergency measures to be taken in case of avulsion before reaching dentist, treatment options for different injuries of anterior teeth and jaws, briefing of different dental treatment procedures done in children. After the lecture a short time was allotted for discussions and clarification of doubts encouraging interaction and participation. After the informative promotion, a 3-month follow-up survey was conducted to evaluate the outcome of the informative promotion on the school teachers' knowledge using the same set of questionnaires. The study was completed over a period of 9 months. The returned questionnaires were coded and entered on computer, using SPSS (Statistical Package for Social Sciences) software, Version 14.0 (SPSS Inc., Chicago, IL, USA). Chi-square test was used to compare the knowledge of teachers (both urban and rural teachers) before and after the informative promotion. The level of significance was set at P ≤ 0.05 (equivalent to 5%). The present study showed that 438 (87.6%) teachers in rural and 474 (94.8%) teachers in urban area had first-aid component in their teacher training curriculum (P = 0.000), and 40 (8.0%) teachers in rural and 47 (9.4%) in the urban area had dental first-aid component in their teacher training curriculum (P = 0.432). Largely the results [Table 1], [Table 2], [Table 3], [Table 4], [Table 5] suggested that the knowledge of teachers on management of soft tissue injuries and avulsed and fractured teeth was poor. After the informative promotion, improvement was observed in the knowledge of teachers, but not to the expected levels, suggesting the need for frequent updating of information to teachers through promotion programs. Table 1: The responses of teachers for "General questions on management of TDI"
Table 2: The responses of teachers for the questions on "Soft tissue injuries"
In the present study, response of teachers was checked on the general aspects of TDI in children [Table 1] and it was found that teachers in rural area came across a greater incidence of TDI during their teaching experience than the urban teachers, which could be due to the over-protective nature of the urban parents that indirectly reflected on the TDI. In spite of the reported greater incidence of observing TDI by rural teachers, urban teachers managed more number of such injuries. This could be correlated with the better dental first-aid knowledge of the urban teachers. Most of the teachers in the urban and rural area were unsatisfied initially with the knowledge they had in managing TDI, which was also shown in other studies, ,, and indicates that educational promotion and preventive programs on dental trauma must be organized. The severe and often serious infection of tetanus and the importance of tetanus prophylaxis were known to many people; unfortunately this has been quite neglected in case of TDI. In the present study, initially majority of the teachers (slightly higher percentage of urban teachers) showed a positive response for tetanus prophylaxis during traumatic injuries and after the informative promotion, the response showed further increase. The present study found that teachers knew the importance of emergency management of soft tissue injuries [Table 2]. However, when it came to the management of the same, rural teachers initially preferred managing themselves with traditional household remedies i.e. application of turmeric rather than consulting a dentist, and in the urban teachers there was divided opinion in the choice of management of such injuries. None of them preferred to manage such injuries using antiseptics, spirit or ointment and it was surprising to know that urban teachers preferred the traditional method of managing injuries like application of turmeric in spite of readily available modern medicaments. Informative promotion was effective in teaching the management of soft tissue injuries for these teachers. Though many teachers knew that knocked out (avulsed) teeth come under emergency treatment [Table 3]a, the concept of management of avulsed teeth has not been fully understood. 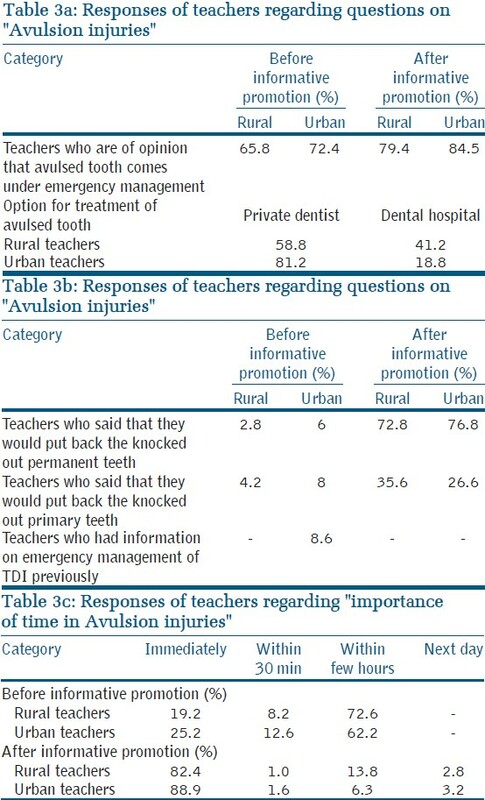 From the teachers interviewed, it was disappointing to find very less percentage of teachers considering the replantation of knocked out permanent teeth [Table 3]b. A controversial issue was the replantation of avulsed primary teeth, due to the potential risk of damaging the permanent successor. This is supported by a study done in Singapore, which stated that people have poor knowledge regarding the replantation of permanent and primary teeth. Time is one of the most important factors for the avulsed tooth to preserve their vitality after replantation, but in the present study most of the teachers cited that they would take the child to a dentist within few hours, with a few teachers stating that they would consult the dentist immediately and within 30 minutes [Table 3]c, which is analogous with the findings noted by a study conducted in Saudi  and in contrast to the findings of Chan  and Ηaglar et al., that 60% of the teachers in Hong Kong and all the teachers from two European cities stating correct time for replantation respectively. Knowledge of the most appropriate method to clean a dirty, knocked out tooth prior to replantation was investigated using a list of alternatives derived from the study reported by Hamilton et al. In the present study, considerably fewer teachers wanted to keep the teeth under running water and most of the teachers volunteered that they would gently scrub the tooth prior to replantation. After the informative promotion, adequate levels of improvement has been achieved in terms of managing knocked out teeth [Table 4]a. The appropriate storage/transport media to permit periodontal and pulpal healing are milk, physiological saline and saliva. The composition and osmolality of milk are more compatible for survival of cells over the root and easy access to milk in the moment of accident makes it the best short-term storage/transport media. The options mentioned in the questionnaire included ice, child's mouth, child's hand and paper/tissue/clean handkerchief. Urban teachers suggested child's hand can be used as the storage/transport media which shows us the lack of knowledge among urban teachers about the storage medium as also noted by Skele,  and majority of teachers had preferred "ice" as better storage/transport medium [Table 4]b which can be related to the popular use of ice for transportation of meat, fish or human organs and accidentally detached limbs. Most of teachers in the present study were of divided opinion with a higher percentage of urban teachers; about seeking an immediate care in cases of fractured teeth. Only a few teachers had managed such injuries in their teaching experience, with slightly higher percentage of urban teachers [Table 5]a. There has been a difference of opinion of urban and rural teachers on the point that, fractured teeth can really have an impact on the aesthetics and the possibility of reattachment of the fractured crown part. As mentioned earlier, poor dental first-aid knowledge among the teachers can be one of the reasons for this. 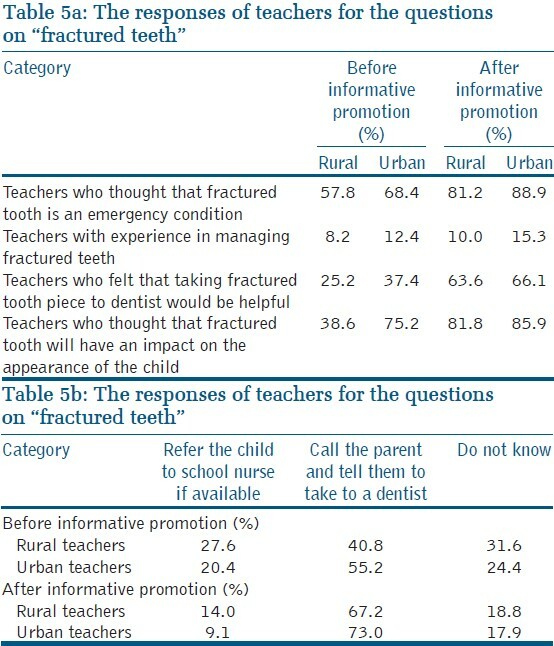 Regarding the concept of management of fractured teeth, both rural and urban teachers were with a divided opinion between sending the child to a school nurse if available, calling the parent and telling them to take the child to a dentist and some of the teachers were enthusiastic to know what can be done in such case [Table 5]b. 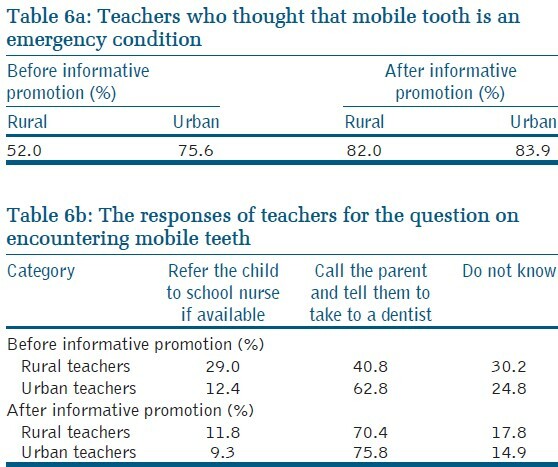 Our survey also showed that majority of teachers personally think that mobile teeth come under an emergency treatment, which is probably because the teachers knew that the mobile teeth may interfere with mastication frequently and is often painful. Regarding the management, findings suggest scattered and varied opinions of teachers with majority of the teachers comfortably saying that they would call the parent and ask them to take the child to a dentist, while one-third of the teachers were not able to decide what to do and the remaining teachers were ready to send the child to school nurse if any available. Our findings emphasize that educational programs and training are needed to enhance proper management of traumatic injuries by school teachers apart from information on dental caries and brushing methods. The Ministry of Health and Family Welfare and Ministries of Primary and Secondary Education should be advised to look into this matter and make it mandatory for all the teachers to have the guidelines on the management of TDI in their teachers training curriculum. As dental professionals we are obligated to educate the lay people who have the probability to be at the site of injury like parents, teachers, physical trainers and traffic police etc. 1. Al-Obaida M. Knowledge and management of traumatic dental injuries in a group of Saudi primary school teachers. Dent Tarumatol 2010;26:338-41. 3. Raoof M, Zaherara F, Shokouhinejad N, Mohammadalizadeh S. Elementary school staff knowledge and attitude with regard to first-aid management of dental trauma in Iran: a basic premise for developing future intervention. Dent Traumatol 2012;28:441-7. 4. Chan AW, Wong TK, Cheung GS. Lay knowledge of physical education teachers about the emergency management of dental trauma in Hong Kong. Dent Traumatol 2001;17:77-85. 5. Al-Jundi SH, Al-Waeili H, Khairalah K. Knowledge and attitude of Jordanian school health teachers with regards to emergency management of dental trauma. Dent Traumatol 2005;21:183-7. 6. McIntyre JD, Lee JY, Trope M, Vann WF Jr. Effectiveness of dental trauma education for elementary school staff. Dent Traumatol 2008;24:146-50. 7. McIntyre JD, Lee JY, Trope M, Vann WF Jr. Elementary school staff knowledge about dental injuries. Dent Traumatol 2008;24:289-98. 8. Al-Asfour A, Andersson L, Al-Jame Q. School teacher's knowledge of tooth avulsion and dental first aid before and after receiving information about avulsed teeth and replantation. Dent Traumatol 2008;24:43-9. 9. Park K. Park's Textbook of Preventive and Social Medicine. 17 th ed. India: M/s Banarsidas Bhanot publishers; 2002. p. 69. 10. Al-Asfour A, Andersson L. The effect of a leaflet given to parents for first aid measures after tooth avulsion. Dent Traumatol 2008;24:515-21. 11. Andersson I, Al-Asfour A, Al-Jame Q. Knowledge of first-aid measures of avulsion and replantation of teeth: An interview of 221 Kuwaiti school children. Dent Traumatol 2006;22:57-65. 12. Sae-Lim V, Lim LP. Dental trauma management awareness of Singapore pre-school teachers. Dent Traumatol 2001;17:71-6. 13. Çaglar E, Ferreira LP, Kargul B. Dental trauma management knowledge among a group of teachers in two south European cities. Dent Traumatol 2003;21:258-62. 14. Hamilton FA, Hill FJ, Mackie IC. Investigation of lay knowledge of the management of avulsed permanent incisors. Endod Dent Traumatol 1997;13:1923. 15. Skele MS, Audestad E, Bårdsen A. Traumatic dental injuries-knowledge and awareness among present and prospective teachers in selected urban and rural areas of Norway. Dent Traumatol 2010;26:243-7. 16. Kahabuka FK, Willemsen W, van't Hof M, Burgersdijk R. The effect of a single educational input given to school teachers on patient's correct handling after dental trauma. SADJ 2001;56:284-7. 17. 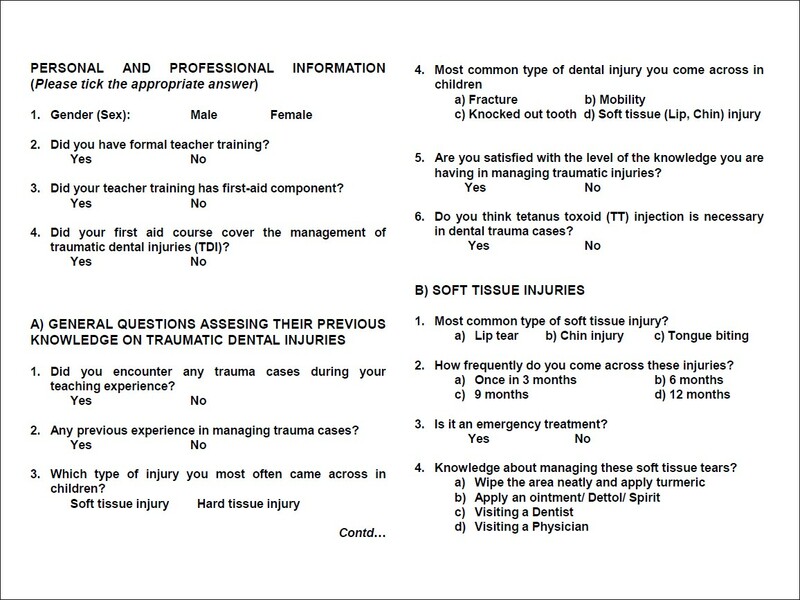 Feldens EG, Feldens CA, Kramer PF, da Silva KG, Munari CC, Brei VA. Understanding school teacher's knowledge regarding dental trauma: A basis for future interventions. Dent Traumatol 2010;26:158-63.